Nathan Milstein studied with Pyotr Stoliarsky in his native city of Odessa, Eugene Ysaye in Belguim and Leopold Auer in St Petersburg. His Russian tour of 1923 launched the young virtuoso into prominence. His accompanist was the young pianist Vladimir Horowitz. In 1925 Milstein and Horowitz were given permission to tour outside Russia. 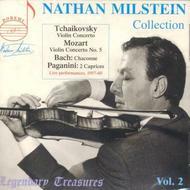 Milstein's magical playing was probably the purest in style of any violinist of his generation. He didn't take liberties in his playing and had an uncanny attention to detail. Technically he was a wizard, yet he never allowed his recitals to be overfilled with virtuoso trifles.